As apart of being a beauty blogger, I’m lucky enough to be exposed to so many incredible beauty products on a day to day basis, from all the incredible brands on the market today. From lipsticks and illuminating bases, to oils, cleansers and hair treatments, I’m always trailing new things and discovering products that I love and naturally, end up featuring on here and sticking in my daily routine but along the way, I find lots that don’t necessarily work for my skin type and therefore pass onto my friends or family. I made a pact with myself last year that I’d only open products once I’ve used up others, a kind of ‘one in one out rule’, which works for some parts of my routine such as day creams and oils whereas things like cleansers, serums and masks I have multiple of on the go to target different skin concerns (hence the number of serums in this empties post!). After a long time of sticking to this pact, I’ve now gathered a fair few empties over the past 4-ish months to products that ran out last week and it’s the first of a few posts on here that will pop up every now and then, once I’ve emptied the next batch of products. I used this face oil non stop until it ran out and it’s still gone down in history as my favourite ever face oil. There’s nothing quite like it on the market or if there is, I am yet to discover it. The beautiful blend of floral oils and actives from Lupin, Turmeric, Evening Primrose and Rosehip not only boast the most divine scent but help the skin in many ways from soothing and hydrating to replenishing and keeping blemishes obey. A much thicker and more nourishing oil in my stash comes from Hungarian brand, Omorovicza and it really does do what it says on the bottle - give you a ‘miracle facial’. The thickness replenishes the skin almost instantly but never does it sit on top, it sinks in like a serum almost immediately, especially when massaged and used with a face tool. Oils of sea buckthorn berry, rosehip and sweet almond have been used to provide antioxidant defence and repair the skins lipid matrix and natural alternative to retinol, Bakuchiol has been used to help with signs of ageing and to improve skins texture. The heavy glass bottle also makes it feel even more of a luxury as it stands proud on ones shelfie. It’s not a cult product around the globe and a Kiehl’s best seller for nothing and everything from the deep blue glass bottle to the signature scent and guranteed radiance in the morning makes this a true skin wonder. The concentrate is perfect for nighttime as the formula works at enhances skins natural recovery process, hence the beautifully glowing complexion come morning! Key ingredients include Primrose Oil, Lavender and Squalene, all of which help to calm, heal, strengthen and restore moisture. Formulated with a cocktail of AHA’s, and Bakuchiol (natural alternative to retinol), Ole’s GLOW serum fades dark spots, fine lines, brightens, provides skin with instant radiance and leaves skin looking plum and youthful - everything you want in a serum, right? The silky lavender coloured formula glides over the skin so smoothly and the slightly pearly tint adds an instant hit of glow which is just a bonus to all the other skin transforming results this serum gave my skin. Designed to correct uneven skin tones, restore luminosity and brighten dark spots or post blemish- discolouration, this 'supercharged' serum from Oskia is another skin hero that carried my skin through good health and texture, month in month out. It only takes one look at the ingredients list to know that this will pump your skin full of goodness and leave it looking so beautifully radiant. The real glow boosting serum of them all and the one I saw incredible results from, this refreshing pearlescent, golden and light reflecting serum instantly leaves skin looking revitalised, brand new and full of life. I used this in the mornings underneath my makeup to get that real lit from within glow and often tapped it on top of my makeup for ethereal and glistening cheeks. If you’re looking at investing in a new serum then this should definitely be top of the list, my routine is lacking without it! An easy everyday serum that helped my skin look more hydrated, radiant and improved the overall texture due to AHA lactic acid that helps skin remain at the correct pH level whilst the bonds between dead skin cells are broken down. For someone trying pre and probiotic skincare, this serum is a great place to start - I’m already onto my second bottle! Zelen’s skincare has never failed to impress me or help fix many a skin concern. Their products are absolutely incredible and this supercharged power serum has been my go to for the past few weeks. I’ve been using it in the mornings and evenings every day for recently (hence it not lasting long) and my skin not only looks healthier, the texture has improved, it doesn’t look stressed and hydration has been amped up. With the weather changes this is exactly what my skins needed, a free radical and environmental aggressor fighting serum that is packed full of game changing ingredients. A multi-tasking, Vitamin B5 infused blow-dry serum spray that keeps my long locks frizz free, smooth, sleek and healthy looking. It’s not often I find a hair serum / protector that I get through but the ease of spritzing this onto damp hair made it a super quick way to keep my hair nourished and protected whether I was blow-drying my hair or leaving it to dry naturally. The best scented texture spray ever to hit the market, let alone my beauty shelf. This stuff is seriously GOOD. Packaged beautifully, scented like a musky perfume and the most ‘barely there’ texture mist of all that perfectly tousles locks for the best undone look. Needn’t I say no more about this incredible face mask? I think the amount of times I’ve featured it on here and talk about it on my Instagram says it all but I couldn’t not mention it again. This Oskia best seller has been designed to boost radiance, give an instant glow and increase cell turnover through using the most skin benefiting ingredients of natural fruit enzymes from Papaya, Passionfruit and Pineapple, AHA Lactic Acid and Rose to hydrate and give it a spa like scent. To make it even better, it comes in the perfect peachy pink toned balm that feels incredibly luxurious on the skin and soon turns white once massaged in effectively. Another Oskia product but an absolute hero and still the best cleanser I have ever used. It’s another cult and for good reason.… The vitamin C and E and Pumpkin Enzyme rich gel to oil formula melts beautifully into the skin, quickly and effectively, removing all traces of makeup and any impurities/grime that has built up in the day. The actives leave skin looking beautifully radiant, luminous, soft in texture, clean and balanced, making it a staple for all skin types from dry and dehydrated to oily and blemish prone. Every time I run out of this, I crave it back in my routine time and time again. 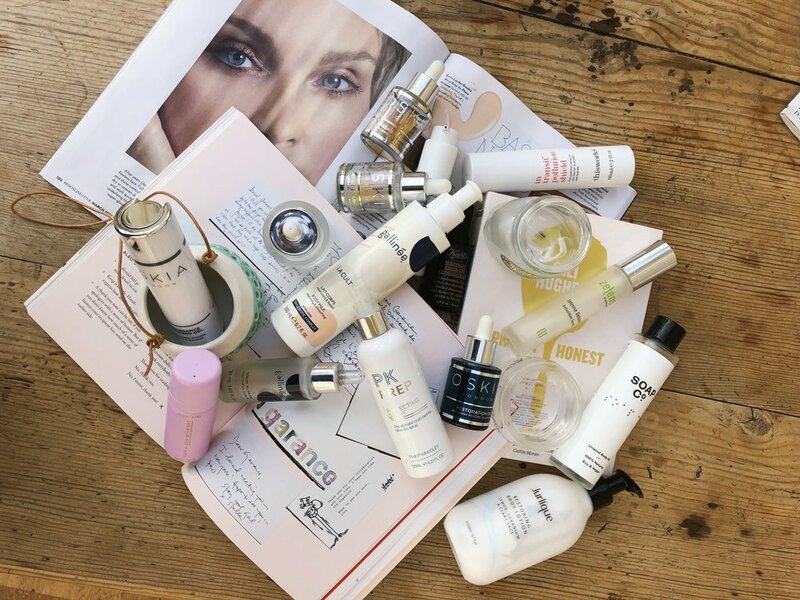 I’ve tried lots of the This Works body-care line but not too much from their skincare ranges, however the In Transit range is one you see in almost every monthly magazine. If you’re an avid reader / follower or Amour Ophelia then you’ll know that face mists are one of my staple products for on the go, desk side and bed side beauty, the benefits are just endless and this anti-pollution spray on mist has been reached for daily over the past few months. Combining Hyaluronic Acid to hydrated, Aloe Vera to reduce redness and irritation and Chamomile to calm, it’s an all round skin fix that’s perfect for refreshing on the go or pre and post makeup. Never has my skin felt so silky and held such a sheen from a lotion before. This precious glass jar of deliciously smelling Almond cream melts into the skin, offering instant hydration. If you’re like me and love Almond scented body products for their relaxing and calming aroma then get this onto your shelf and watch your skin transform into a cloud of softness. Another absolutely gorgeous product in the body and skin softening department. Rich in antioxidants, omega 6 fatty acids and vitamins, this silky and thick nourishing oil condition the skin in Jojoba seed and Evening Primrose oil for super hydrated and glowy limbs. 100% organic and vegan, Lavender, Sandalwood, Juniper Berry oils give the ultimate relaxing scent and nourishing benefits to the skin whilst calendula has been used to soothe and heal. Repairs, soothes, hydrates and supports our skins micro-biome by feeding it with a dose of bogbean, sweet almond oil and Gallinée’s Triple Biotic Complex of Lactic Acid, Probiotics and prebiotics that support skins micro-biome. By using AHA lactic acid, dead skin cells all over the body are broken down and sloughed away at to reveal more luminous skin beneath whilst also promoting faster cell renewal. It’s my 3rd bottle of this stuff and it’s still one of the best body lotions for super soft skin. Geranium, Sage and Lemon are what make this lotion such a delight to use (the ultra creamy texture is just an added bonus). This is my second bottle of Jurlique lotion and I have to say they are just great all round day to day body moisturiser that keep skin supple, hydrated and allow you get dressed straight away without having a pair of jeans stuck to your leg. Sadly no longer available to buy in the UK (but one I had to mention), otherwise I would be re-purchasing and slathering on all over again! I hope you enjoyed reading about all of my recent empties! There are so many great products in here that I will be using time and time again. All products marked with a * have been gifted to me by the brand or PR agency.